The tram in this shot is no. 525 which was one of 90 Feltham trams transferred from London Transport in 1950-51 to operate in the West Yorkshire city of Leeds until the system there also closed in 1959. 525 – as numbered in Leeds – was from a batch of trams which were originally built for Metropolitan Electric Tramways in 1930. Although two of this batch do survive in preservation (MET 341/LT 2085/Leeds 526 in the USA and MET 355/LT 2099/Leeds 501 at the London Transport Museum’s Acton store) 525 was not so lucky and was scrapped following the closure of Leeds Corporation Tramways in 1959. 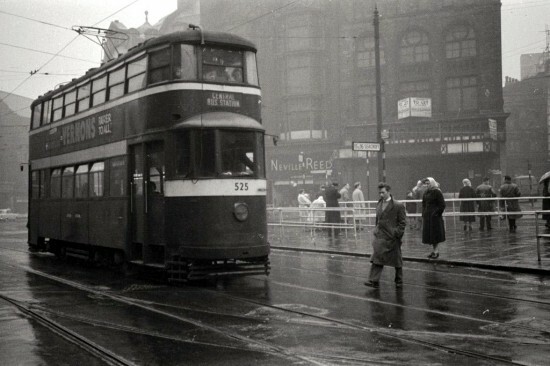 In this view – taken on 8th November 1958 – we see 525 in Corn Exchange with a service bound for The Central Bus Depot.